Celebrate Excellence was a great experience for me. 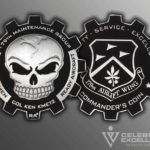 They take the same kind of pride in delivering quality products and excellent customer service as to those that might earn a commander’s coin. From design support and ideas to the finished product — they exceeded my expectations. Thanks.